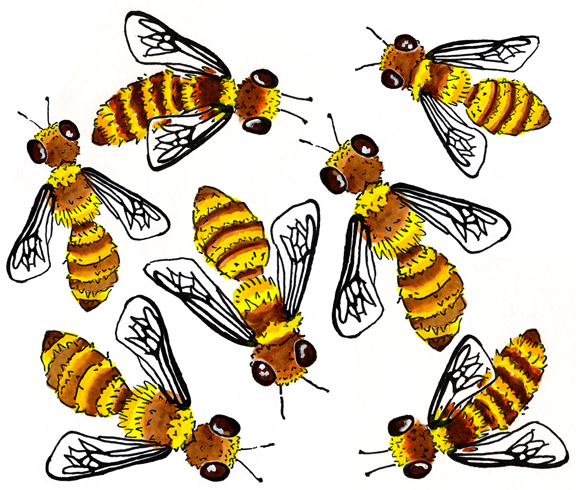 Here are the bees ready to print! I’ve arranged seven of them onto a yard of fabric. They should be nice and big for the quilt. I’m making this design free on Spoonflower. That means that you can print them yourself and use them for (nearly) anything you’d like. You still have to buy the fabric from Spoonflower, but there’s no additional cost added by me. Please note that I do retain copyright for the images, so they are intended for personal, not commercial use. If you want, say an Apis mellifera tote bag for farmers market, or a really funky skirt they’d be great though!